Credit: Hale County Sheriff's Dept. 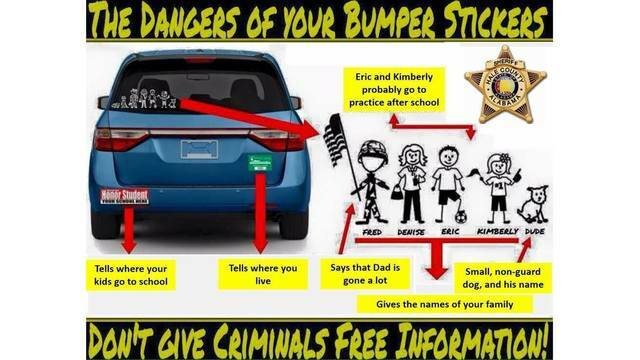 (NEWS10) -- Police are issuing a warning to be careful about giving too much information on bumper stickers. The Hale County Sheriff's Department posted the warning on their Facebook Page. Police told WBRC that it may seem harmless, but even the little things may give criminals the upper-hand. Police recommend not using bumper stickers that depict your life story - like honor roll stickers indicating where your child goes to school, who is in your family, etc.